Increase your productivity by never leaving the home row. Improve your posture by typing on two, separate keyboard halves. Remap your keys in any way you want. 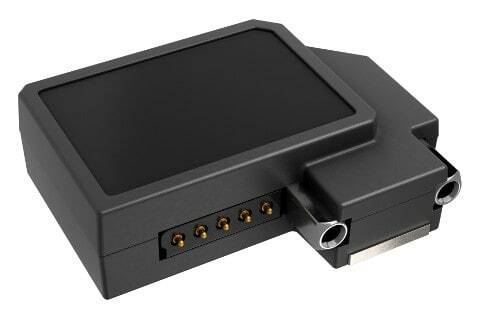 Extend the UHK with modules such as a trackball, trackpoint, touchpad, or a key cluster. Experience how a keyboard can be different, yet still familiar. New orders are expected to ship in two weeks. First come, first served. As we ship from Hungary, customs charges may apply outside the EU. 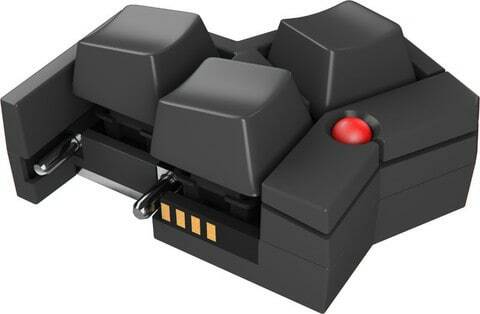 The Ultimate Hacking Keyboard is a split mechanical keyboard which utilizes Cherry MX-style switches. It's also a fully programmable keyboard which can be vastly customized for your needs. If you need a compact, ergonomic keyboard or looking for the programmers' keyboard, then look no further! 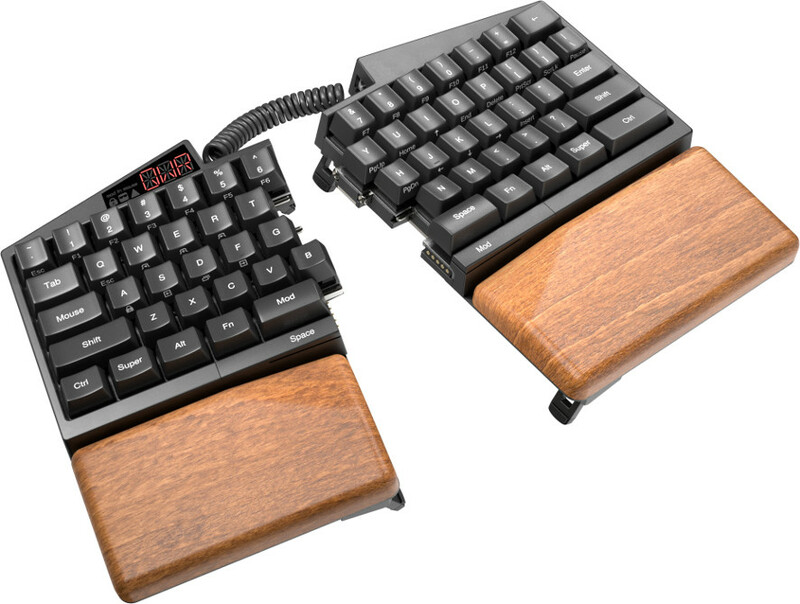 As a truly split keyboard, the two keyboard halves of the UHK result in a more natural typing posture – rather than forcing your wrists to adapt to a straight keyboard, you can adjust your keyboard so that your wrists are straight. The halves are connected by a replaceable bridge cable which expands and shrinks as needed, occupying minimal desk space. The UHK palm rest belongs to a class of its own. It's made from natural beech wood, which is then machined, pickled, lacquered, and finally fixated to a powder-coated steel plate. It offers a unique combination of warmth, class, and durability. The palm rest firmly attaches to your UHK, and it's strongly recommended for maximum ergonomics. This module features three regular keys, two buttons and a mini trackball which can also be pressed – acting as an extra button. This is the only currently available module for the left keyboard half. The trackball features excellent precision and usability and is well-suited to be used by a thumb. This module is designed for the right keyboard half. The trackpoint surely brings back fond memories for those of you who have owned an IBM ThinkPad laptop in the past. With it, you can not only move the pointer, but click by pressing it. This module is designed for the right keyboard half. The touchpad shouldn’t be stranger to anyone these days. This module takes it to another level by placing the touchpad where it’s easier to reach – right at the middle of the keyboard. You can emulate clicking with a tap. This module is designed for the right keyboard half. Agent is the configuration application of the UHK. Unlike other keyboard configurators, Agent allows for easy, yet deep configuration of your UHK. Its user interface was crafted to be powerful, yet intuitive. Agent provides loads of advanced features, like mouse keys, dual role keys, shortcuts, multiple keymaps, layers, macros, mouse speed settings, and more. You can save your configuration in a second with a click of a button, and take it with you. Your UHK remembers its configuration without Agent. Agent runs on Linux, Mac, and Windows. Check out the web demo of Agent. Layers provide a way to map multiple functions to a single key. Think of the Fn key of laptops, but unlike laptops, there is not one but three layer-switcher keys, namely Mod, Fn, and Mouse. These three, in addition to the Base Layer, give you four separate layers. The Base layer contains regular alphanumeric keys. The Mod layer contains navigation and function keys. The Fn layer contains media keys to adjust volume and switch tracks. The Mouse layer allows you to control the mouse pointer, click and scroll. It's a whopping 240 variations! How do we do it? When you order a keyboard from us, we don't just take it off the shelf. We assemble it just for you in our factory and then ship it directly to you. See the UHK product page for a detailed description of each option. The UHK was never meant to be a black box. It’s very important for us to open up the design so that you can infinitely customize it to your needs. We know that this mindset pushes innovation forward, and it resonates with many of you. Agent, the UHK firmware, and the UHK electronics design files are developed in the open, and hosted under our GitHub account. You can even design your own modules! We're sworn enemies of planned obsolescence and designed the UHK to last as long as possible which is good for your pocket and the environment. If your UHK for some reason breaks, our two-year warranty applies, and afterward, we provide replacement parts, repair guides, and we'll even try to help you after the warranty period ends. "The Ultimate Hacking Keyboard feels just as sturdy split apart, as it does when it's joined together." "They’re really serious about not taking your hands off the keyboard." "[The UHK] is proof positive that even compact, performance-designed, single-purpose gadgets can be designed for repair, from the ground up—complete with repair documentation." "… there’s been a notable shortage of keyboards that reinvent the concept for people who spend more time working than playing. That’s where the UHK plans to come in." #GotMyUHK @UltHackKeyboard You guys matched my desk almost perfectly. :) Initial impressions: VERY good. + Caps and Switches all feel premium. + Agent and the setup was painless and well done.